We are excited to announce that HOT FLASH HAVOC is coming to PBS starting March 2016. This updated and newly revised 2016 documentary is now narrated by Academy Award Winner Goldie Hawn. HOT FLASH HAVOC is not only a movie, but the beginning of a movement that will educate and empower women, men, health care professionals, hospitals, schools, clinics and health care systems worldwide by ensuring everyone has the most up-to-date and accurate information about menopause, directly from world-renowned experts in the field. We are thrilled that so many people will have the opportunity to see the film through PBS, which reaches over 118 million households throughout the United States and Canada. We believe HOT FLASH HAVOC will give women a new perspective on the "Second Act" of their lives. You can help us make this happen! See the list below for particular dates and times when PBS will be showing the film in your city. If you don’t see your local PBS station listed, please call them and ask when you can see it. If you missed seeing it aired, call and ask them to please show it again! 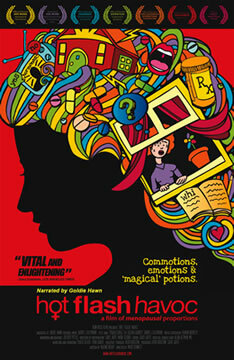 CONTACT YOUR LOCAL PBS STATION AND REQUEST TO SEE THE AWARD WINNING DOCUMENTARY HOT FLASH HAVOC!